If you think back into the not too distant past, gluten free breads were a challenge to find. Thankfully, it’s much easier to source these days and gluten free mixes mean you can even bake gluten free breads easily in your own home. We include Glebe Farm’s White Flour and Seeded Brown loaf mixes in our gift hampers because they produce the most wonderfully soft flavour-filled loaves. They taste good at any time of day. No surprise then that each bag contains enough to make four loaves. 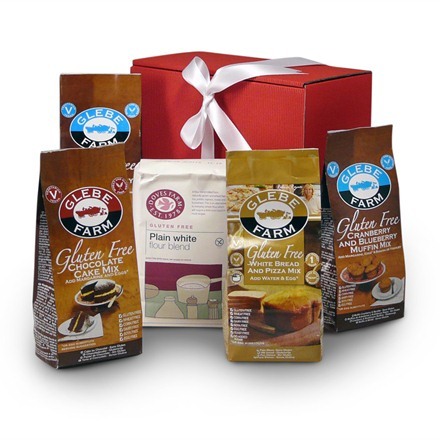 Glebe Farm bread mixes are gluten free because the more traditional wheat flours have been replaced with gluten free rice flour and potato starch. The mixes are also free from methyl cellulose, GMOs and other chemical additives, making them a sound healthy choice. The baking couldn’t be easier either. Baking: Bread machine or Oven Bake? The mix is prepared for bread makers and ovens – so you can choose which every method suits you. Of course, if you’re invited Paul Hollywood around for afternoon tea, you might want to kneed and prove in the traditional way. But for everyday, a loaf made in a bread maker tastes just as good as it if were oven-baked. For even great flexibility, you can choose whether to make a yeast or non-yeast loaf too. Pizza is a quick and easy supper to make on days when you’re entertaining a surprise hoard or when you’re too tired to think about what to cook. This recipe gets made – pretty well makes itself – before you’ve even realised you’re in the kitchen. 140g of cheese: vegetarian cheddar, feta and/or mozzarella taste lovely. This recipe creates a 12″ (30cm) pizza which feeds between 2 – 4 people depending on age and appetite. Pre-heat the oven to 200°C, 400°F gas mark 6 and grease your round oven-proof dish. Add the Glebe Farm mix and water into a bowl and stir into a batter. Pour the batter into your pan and bake in the oven for 10-15 minutes. Crush your tomatoes with a potato masher or food processor. Add the herbs and garlic. No need to heat. Take the pizza base out of the oven, Spread the tomato topping over the crust, almost to the edge. Add your chosen cheese(s) and return to the oven for 20-25 minutes until golden. Lift onto a plate and serve warm. Pass the toppings around and let each diner assemble their own pizza. And all this from just one easy bake gift box! Got any suggestions for fresh pizza toppings? We’d love to hear them. < Previous How do we choose what goes into our gluten free hampers?